A classic appetiser - garlicky mushroom vegetarian pâté, made with walnuts and chickpeas. Great served 'potted', or in any number of other ways! 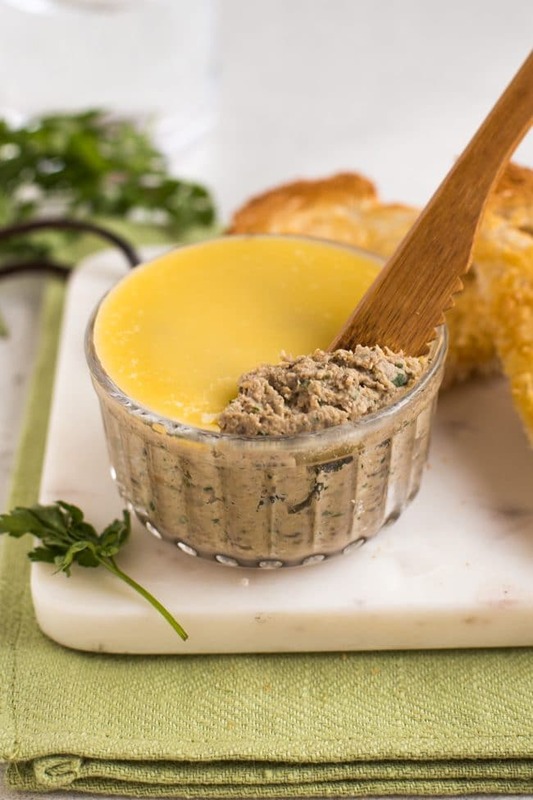 Mushroom pâté is a classic appetiser, and this version couldn’t be easier to make! Just combine a few simple ingredients, including garlic mushrooms and chickpeas, to make a simple dish that will go down a storm. I’ve got a bit of a retro recipe for you today – garlic mushroom pâté! 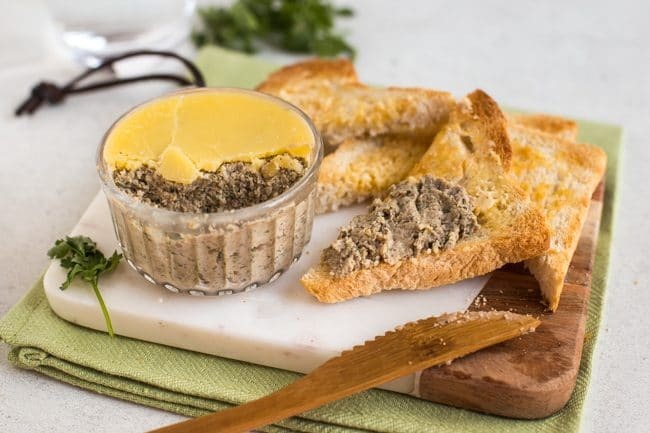 I wasn’t alive in the 70’s, but that’s the kind of era I imagine when I think about mushroom pâté, especially when served ‘potted’ – topped with a thick layer of butter. But there’s a reason some recipes turn into classics – because they’re good! So dig out your bell-bottoms or over-the-knee boots, and let’s get retro. 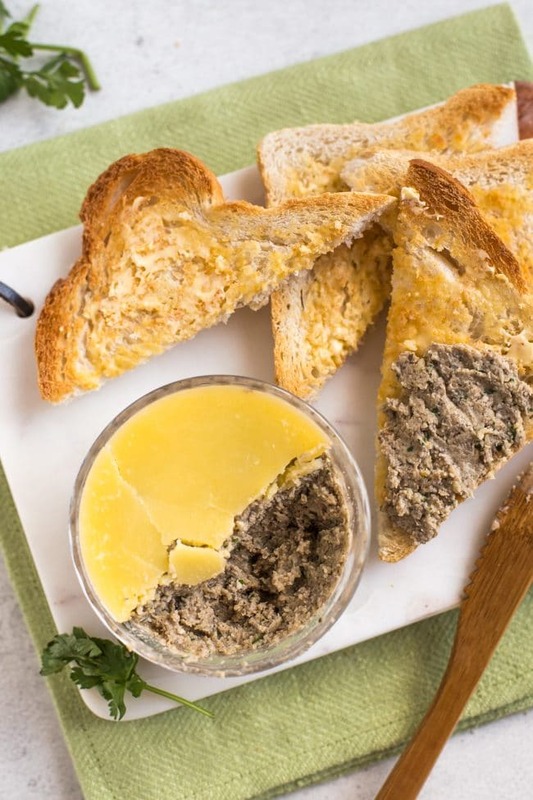 I know not everyone loves mushrooms, but for a lot of people it seems to be because of their texture – so mushroom pâté is actually a great way to ease in to loving mushrooms! You get that gorgeous garlicky mushroom flavour, with a smooth and creamy texture. Once the pâté is all blitzed up and spread on a piece of crusty toast, the texture of the mushrooms is long gone. 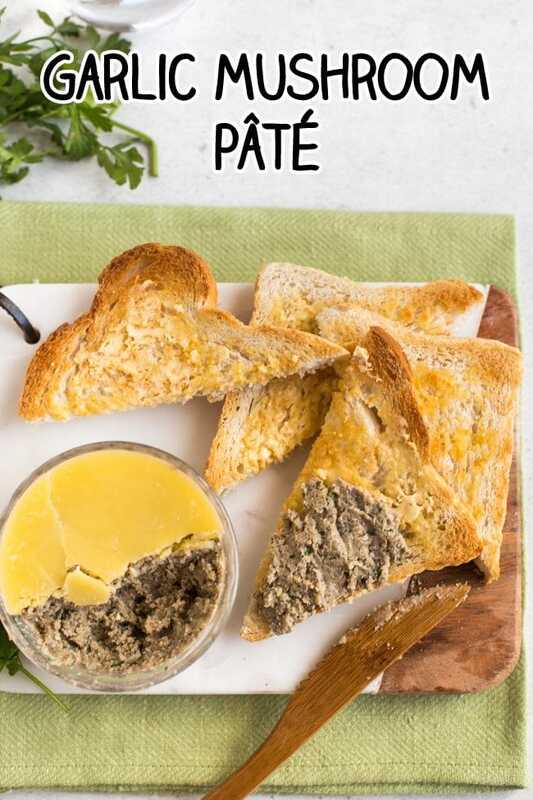 Pâté may sound fancy (it’s not often you see a word where 50% of the letters have an accent), but it’s actually unbelievably easy to make! 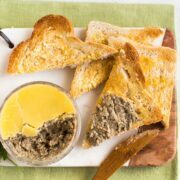 This mushroom pâté starts in the same way that a lot of my vegetarian pâté recipes do, with chickpeas and walnuts. It’s a combination that makes a brilliant, hearty base for whatever flavours you decide to add – and it’s high in protein too! Just add your chosen ingredients to turn the simple chickpea mixture into any kind of vegetarian pâté you like. In the past I’ve made all sorts of pâtés – I’ve added roasted vegetables, spices, feta cheese… the options are endless. You can also switch out the chickpeas for a different kind of bean, if you have something different in the cupboard. This time I added some garlicky sautéed mushrooms and fresh parsley – a classic combination. There are two ingredients in this recipe that aren’t vegan, but they’re both really easy to avoid if you’d like to make a vegan version. Firstly, I added a dollop of cream cheese to make my pâté extra creamy and luxurious. You can easily use a vegan cream cheese here, or just skip it altogether if you’re happy to have a less creamy pâté. I also topped my mushroom pâté with a layer of salted butter. 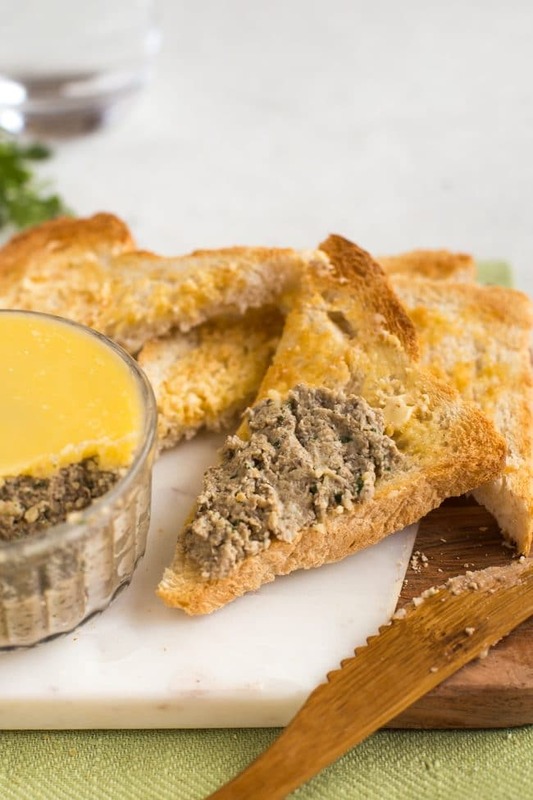 When you spread the pâté onto hot toast, the butter melts right down into it – it’s pretty special. But again, easily skipped! ‘Potted’ food is simply food that’s been covered with a layer of fat as a way of preserving the food underneath, which is protected from the air. It used to be a way of making meat last longer, before fridges were commonplace. I may not eat meat but hey, if I want a layer of butter over my mushroom pâté, I’m going to have it! I’m not trained in food safety, so I wouldn’t like to advise about exactly how long you can store this mushroom pâté for, either with or without the layer of butter. The standard recommendation for fresh food is 3 days in the fridge, so although I reckon you could get an extra day or two out of this pâté, I’ll just say 3 days. How can I serve my mushroom pâté? If you’re embracing the retro theme, I’d recommend serving your mushroom pâté in individual ramekins, with triangles of toast on the side – it’s a classic dinner party appetiser. Or, if you’re feeling less fancy (i.e. how I feel 99.9% of the time), it can be used in any number of other ways. …or however else you fancy. This recipe makes a decent sized batch (probably about 6 generous portions), so keep it covered in the fridge and just grab it whenever you spot a use for it! 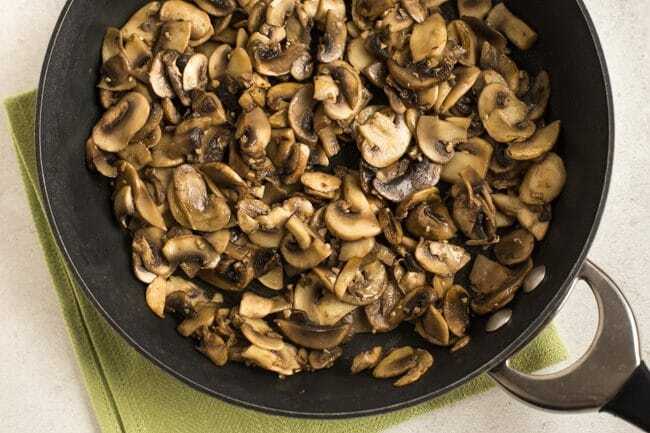 Heat a dash of olive oil in a large frying pan, and add the sliced mushrooms and minced garlic. Cook over a medium-low heat for 5-10 minutes, stirring regularly, until the mushrooms have softened, and any excess liquid has cooked off. Remove from the heat and allow to cool for a few minutes. 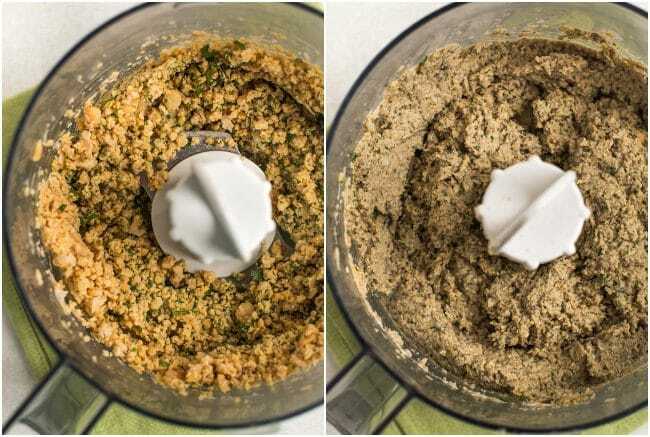 Meanwhile, add the chickpeas, walnuts, and fresh parsley to a food processor. Blitz to produce a coarse crumb. Add the garlic mushrooms and dried thyme, and blitz again until fairly smooth. Add the cream cheese and plenty of seasoning, and blitz one more time. Divide the mushroom pâté into individual ramekins - you should be able to make around 6. Top each ramekin with a little melted butter, and leave in the fridge for several hours to set. Alternatively, you can skip the butter, and just store the pâté in a bowl instead. Best served lightly chilled. Note: Nutritional information is approximate, and will depend on exactly what ingredients you choose. Information above is for 1/6 of the recipe, including butter topping. Mushroom lover? 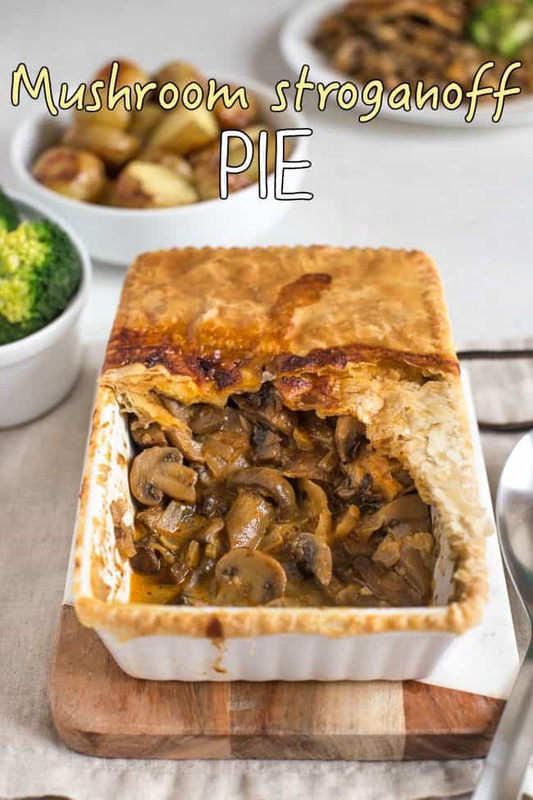 Why not try my mushroom stroganoff pie! I’ve not tried this, sounds great! I love crispy toast. Sounds good, I would hate to compete with David Lebovitz, but I hope you like it! My mother’s mushroom pate recipe is slightly different (she doesn’t use garlic, as my father dislikes it, but as he can no longer taste much – a disadvantage of being almost 95 – she has begun to reintroduce it in judicious quantities), and flavoured with nutmeg. It’s delicious, but I must try making yours and comparing/contrasting! I love mushrooms and garlic so this is definitely a recipe for me. The other ones look interesting too – thanks, I’ll give some of them a go. Btw I was very much alive in the 70s! Hehe thanks Mary, hope you enjoy it! Lovely! I really need to try this, it sounds amazing! This would be a great starter. Sounds great, so glad you like it! Thanks Andreea! Classy, simple, delicious. I love all the ingredients playing here… I could snack on this the whole day and even have more for dinner!